30' Wide x 41' Long x 14' High Enclosed Workshop with Vertical Roof System (Best). Be advised the customer installed the garage doors, walk-in door, and window in this unit. We do not provide these types of garage doors, walk-in doors, and windows. They are displayed to illustrate custom options that the customer can provide for themselves if they do not want the options that we provide. The cost of those options are not included in the price. Please call us and we will be happy to provide a price with our doors and windows if you want them. Metal Carports Direct is known for providing top quality enclosed, vertical roof metal garages and steel buildings at the best value. Our mission is to provide our customers all of the information that they need to make the most informed buying decision possible. Our team will work with you to determine your exact need and provide you with various options so that you can choose the best one that works for you. That is the easy part! 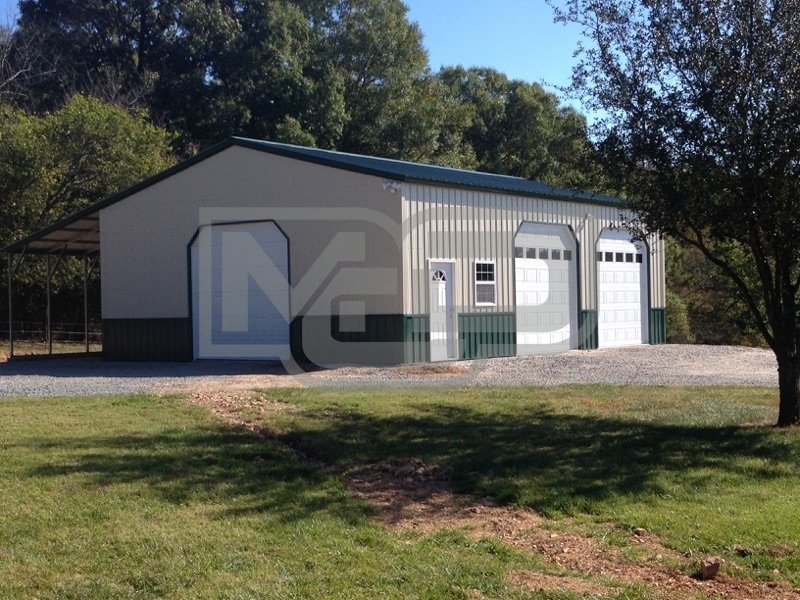 Once we have all of the information that we need to build your vertical roof metal garage or enclosed metal building, we will provide you with the exact cost of the unit, delivered and installed on your site. The only thing that we require is that you look over your order to ensure that we have every detail as you need it. If so, you will sign off on the order, pay a small down payment to get the order started, and we take care of the rest. It is really that easy! We look forward to serving you!